A nostalgic period musical from Fox which, at times, seems to be emulating MGM's Meet Me in St Louis. Set in Philadelphia in 1876, where the Great Exposition is a cause for excitement, the film stars Jeanne Crain and Linda Darnell as sisters whose relationship suffers when they both take a fancy to dashing Frenchman Cornel Wilde. Veterans Dorothy Gish (sister of Lillian and a one-time silent star) and Walter Brennan play the girls' parents, but the real star of Otto Preminger's pleasant and undemanding trifle is the music, composed by Jerome Kern shortly before his death. 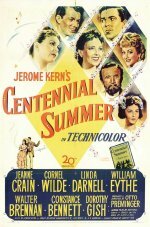 Plot Summary Musical set during the Philadelphia Exposition of 1876, starring Jeanne Crain, Linda Darnell and Cornel Wilde. Two sisters both vie for the attentions of the same man.